It's not without its faults, but the Sample's workflow is exceptionally fun and fluid. Another winner. Surprisingly deep sample shaping capabilities. Pleasantly old school vibe. Fun, fluid workflow. While each had its own minor limitations, foibles and flaws, it would have been hard not to fall for the trio of instruments that comprised Korg's initial Volca range. Each was endlessly fun, sounded better than they had any right to at that price and, even now that the 'affordable analogue' novelty value has worn off, a year on from their release, they're still proving to be genuinely useful studio tools. Given this success, it was somewhat inevitable that more would follow. Enter the next step: the Volca sample - a ten part sample sequencer inspired by "the excitement of the first generation of samplers" and sporting a white, red and grey colour scheme that gives a cheeky nod in the direction of the classic MPC. Design wise, the Sample shares a lot of key traits with its predecessors. It's housed in the same plastic chassis with metal top, complete with the 16-step sequencer-come-control panel, basic LED screen and slightly fiddly plastic rotaries. "It's quite remarkable how easy it is to create relatively fully-formed beats and loops in next to no time"
As with the others, the Sample will run on either six AA batteries or a mains adaptor, although the latter is sold separately. Again the unit features a built-in speaker on its underside, but it's a weedy affair with absolutely no low-end, and in reality proves to be a largely pointless addition. That aside, the only other audio output is a 3.5mm headphone jack, which sits next to a MIDI input and 3.5mm Sync In and Out ports, which allow the Sample to be synchronised with other Volcas, Electribes or compatible gear. As was the case with the original trio, it's obvious where design and build concessions have been made to keep the price low, but these tend to be forgivable and don't hamper the 'tweakability' that makes the Volcas such fun instruments. Beyond this, the Sample differs from the rest of the range in a few notable ways. For one thing, it's a predominantly digital instrument. Whereas the original Volcas were primarily analogue with a few digital flourishes, the Sample is a digital device with the addition of a global Analogue Isolator circuit, which can boost or cut the bass and treble frequencies of the output. Being digital, the Sample features far more extensive sequencing capabilities than its predecessors, with the movements of 11 parameters per sample recordable via the Motion Sequencer, and the addition of a Song Mode, which allows users to save and recall arrangements of up to 16 sequences. It's also the first of the Volca range to feature any kind of panning capability, as well as a Swing function - both of which were notable omissions from the Volca Beats. In terms of its core capabilities, the Volca sample is a ten part PCM sampler (although with a maximum eight part polyphony) which can be controlled via the 16-step sequencer or 'played' and recorded using the sequencer as a keyboard. There are 11 shaping parameters for each of the ten sample slots. These allow you to tweak the start point, length and playback speed of the sample, adjust the level and pan, and apply a low-pass filter. Each also has a pitch envelope, with Int, Attack and Decay controls, and an amp envelope with Attack and Decay. All these parameters can be recorded and played back via the Motion Sequencer. There's also a Reverse function for each sample, and a global reverb effect with a wet/dry mix control. The built-in memory can hold 100 samples, with a maximum capacity of 4MB and 65 seconds, effectively limiting the unit to short hits and one shots. There is one very notable omission though, in that the Volca sample features no built-in sampling capabilities of its own. It can be loaded with user samples, however, but doing so requires the use of a free iPhone app. Sound wise, the unit's 31.25kHz/ 16-bit sampling and Analogue Isolator combine to lend the Volca a slightly 'crusty', albeit not unpleasant, lo-fi edge. The Isolator's bass cut is fantastic for creating breaks, build ups and pulsing kick rhythms, although personally this writer feels the treble control lacks bite. Meanwhile, the digital reverb is a little limited, but it's still useful and sounds nice enough. Combined with all the other shaping and sequencing functions, it's actually quite remarkable how easy it is to create relatively fully-formed beats and loops in next to no time. In fact, given its surprising depth, the biggest downside is actually the single audio out, which severely limits your options when it comes to getting your ideas out of the unit and into a DAW. 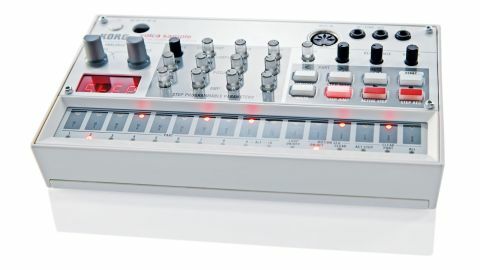 In this respect Korg's own new Electribe Sampler might be the Volca's biggest rival, given its ability to export individual tracks directly into an Ableton Live project. Still, niggles and limitations aside, this might be the most fun, flexible and inspiring Volca product yet and, at this price, that's what really matters.